Raw and pasteurized goat milk produced at a Grade A facility! Welcome to stop by anytime during daylight hours. We keep a very limited supply on hand so please pre-order if in need of anything special. Raw milk is bottled early Mon and Thu mornings; pasteurized milk Fri afternoons. Be sure to bring a cooler with ice to ensure your milk stays cool for the freshest taste and longest shelf life. Goat Milk Straight off the Farm! Fresh Raw Milk at the Retail Markets! "...thanks for providing an awesome product which I thoroughly enjoy!" "...thank you for producing this milk. As far as I can tell, you are the only provider of raw milk doing it the way it should be done. I really appreciate all the effort you are putting into your product". day stay (in Idaho) a most memorable one. I miss your milk already"
"I just wanted to state how impressed I am with the mildness of your milk. Thank the "girls" for me." "I just purchased your raw goat milk for the first time. It's wonderful! I feel very good about drinking your milk, and appreciate the opportunity to read your web site". "....I noticed you had pint sized goats milk. Because of the small amount I thought I would be brave and give it a try. I have to tell you that I was so pleasantly surprised at how good it was. I am so glad I got brave and went for it because it is a good A2 milk solution!" "Your milk is the best! I just discovered your goat milk this week.......purchased a bottle from the Boise Co-Op. Your milk is even better than the goat milk I had as a child from my family's milk goats." to thank you so very much for all of your hard work. I can only imagine the bureaucratic red tape you had to go through! "Wonderful people and sweet creamy milk at a clean, well organized and well run dairy. You will not be disappointed with the product or the customer service." "I have been buying raw goats milk from them for a month now. They are very knowledgeable and always willing to help you out!" "Love this milk! Great little operation. Clean grounds - healthy pastured animals"
"I've never liked anyone's goat milk, yours is very good...."
is applied to prevent mastitis. The milk is filtered and dumped into a small bulk tank (left), where it is quickly cooled and stored below 37F, until bottled and shipped to the retail markets. When the milking has been completed, the milk lines and all equipment are rinsed and washed with two different dairy cleaners, and the entire milking parlor, and adjacent milk room, are hosed down. The chilled milk is bottled in plastic dairy containers, with tamper evident caps. Due to our Grade A certification our milk must be packaged with an approved bottler/capper. Glass bottles can not be used with our equipment. As our dairy is Certified Grade A the entire facility, including milk processing area, equipment, parlor, livestock barns/corrals, and waste water containment, is inspected several times a year. Milk samples, one of each product, are also collected monthly by an ISDA inspector, and taken to the dairy lab. There, tests are ran on the milk to check for standard plate count bacteria, coliform, and somatic cell count. Milk samples may also be checked for Q-Fever. We are required to test the milking goats for Tuberculosis and Brucellosis yearly. All milk produced at a Grade A facility, unlike that of the Small Herd Exemptions, is required to be tested for antibiotics before being bottled or sold. Our goats enjoy large irrigated pastures through-out the growing season. They are also fed high quality non-GMO alfalfa hay and a non-GMO grain mix we personally make! No commercial grain mixes or GMO feeds are fed! Fresh water and vitamin/mineral supplements are always available. No hormones are given to increase milk production. The herd is regularly treated for internal and external parasites using approved dairy-animal wormers. Antibiotics are only used in an emergency where the animal's well-being is in danger. Sick animals are immediately pulled off the milk line until completely well, and all medication withdrawals have been completed. Proper housing is provided for all the animals. Goats have large enclosed barns with hay feeders undercover for winter feeding. Young kids are housed by size and age groups, and always separate from adults. Pregnant does are also separated from the main milking herd during the last two months, as goats do love to challenge each other and fighting can be fatal to the unborn kids. 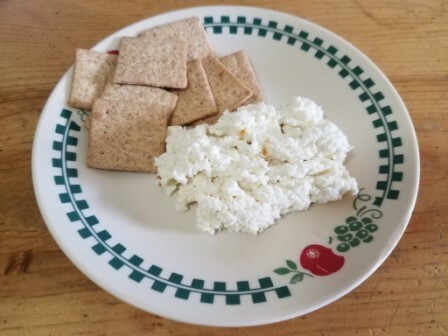 Simple Recipe for Making Soft Goat Cheese! 1. Heat 1 gallon of milk to 180F slowly. 2. Add 1/2 cup of vinegar, white or red wine. 3. Drain through a fine strainer or cheese cloth. 4. And we have 2 pounds of soft creamy cheese! 5. Mix in salt and seasonings.